Lucky bamboo (Dracaena sanderiana), also known as curly bamboo, is a tropical plant valued for its ease of care, easily manipulated growth habit and pleasing appearance. Despite its name, lucky bamboo actually belongs to the Dracaena family. The plant's common name derives from its supposed ability to bring good fortune to its owner and its resemblance to real bamboo. Native to Asia and Africa, lucky bamboo requires a warm, humid climate to thrive. For this reason, gardeners in the United States typically grow the plant indoors to better emulate its native growing environment. Plant lucky bamboo in a vase filled about halfway with water. The plant requires no soil and will grow happily in a vase for many years. Only use distilled, purified or rain water, as curly bamboo is sensitive to the impurities in tap water. Add small stones to the vase to provide support for the plant and increase its visual appeal. Fill the vase with stones until the lucky bamboo stalk stands upright without any other support. Keep the plant in a location that receives indirect, bright sunlight throughout the day for optimal growth. Change out the water in the vase once every two to three weeks to prevent impurities and dirt from accumulating. Pour all water from the vase, rinse it out thoroughly to remove any debris and refill with fresh, pure water. Clean the stones thoroughly when the water is changed. 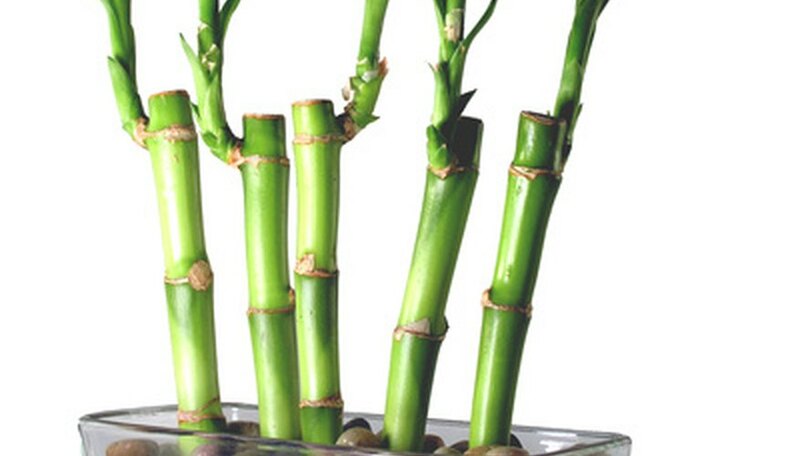 Feed lucky bamboo every two to three months using an all-purpose liquid houseplant fertilizer. Add a single drop to the water at each application to avoid over-fertilization. Only feed during the spring, summer and fall months. Control the growth habit of lucky bamboo by blocking all light from three sides of the plant and placing a bright light source on the fourth side. The plant will begin to grow toward the light source. Change the location of the light source after significant growth has occurred, and the plant will continue to follow the light, resulting in a twining or “curly” appearance. Fertilization is optional, as many plants survive for years with no added nutrients. However, the plant's rate of growth and appearance are substantially improved with regular feeding. Use pebbles, river rocks, marbles or glass beads instead of stones if desired.